One of the characters from a great Star Wars television show is making it to the big screen next week. What do we know about him? 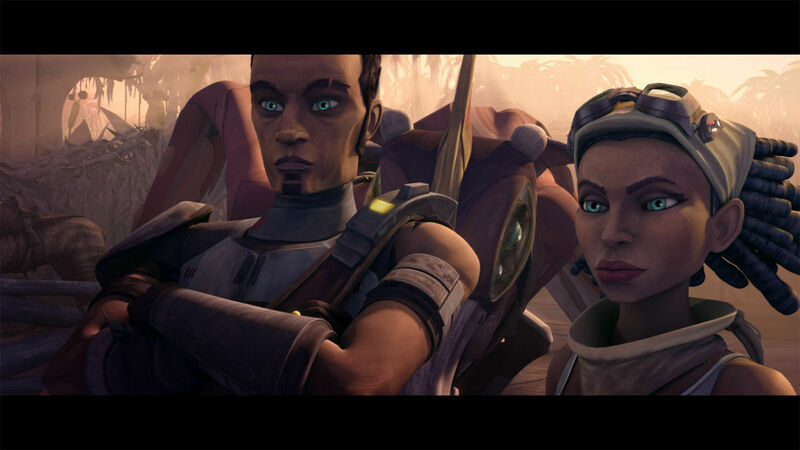 The newest Star Wars cinematic release, Rogue One, which arrives in theaters next week, will be including a character, Saw Gerrera, who appeared in several episodes of Star Wars The Clone Wars, so we have some material upon which to base our understanding of him. Upon his departure to go free the erstwhile king, his sister articulates that “He’s always been brash. Never thinks. He doesn’t realize, by leaving us, he’s hurting us.” Indeed, what ends up happening is that he gets caught trying to save the king. 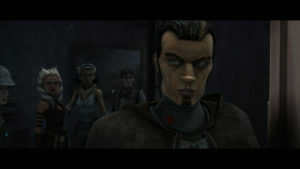 In a recent interview on Fangirls Going Rogue, Andrew Kishino, the voice actor for Saw Gerrera, spoke about this moral compass of Saw’s: “Saw is that person who is always trying to do the right thing in his head and he’s always pretty much morally pointed in a very noble direction, he just can be incredibly abrasive in his execution. 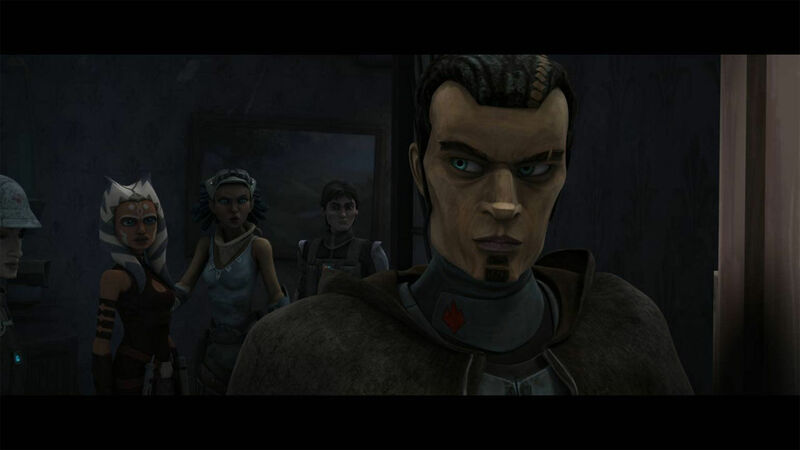 And, for better or worse, that’s who he is.” Indeed, in Star Wars The Clone Wars, if Saw got determined about something, he was gung ho about it. Speaking of being gung ho, Saw Gerrera is very aggressive, especially when it comes to fighting. 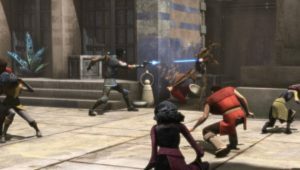 We have a clear understanding of this aggressiveness when Saw meets the Jedi who have come to Onderon to train them and he excitedly claims that “We’re looking forward to taking the fight to those scrappin’ droids.” It’s not just an empty claim as we see him aggressively attacking Separatist droids at the beginning of “Front Runners”. We also see it later on in the same episode when the rebels are trying to figure out how to gain intel and Saw inquires, “Those droids should have all the intel we need stored up in those tin cans of theirs, right?” Once he understand that they do, he says, “Then I’ll get us one” and goes off and does it. 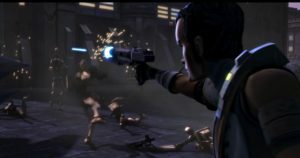 Also in the episode, we see his aggressiveness and fighting spirit when he points out “We need to build on our momentum and continue our attacks to keep them off balance.” He is almost always very aggressive, especially as we see when he attacks a Separatist gunship with a rocket launcher while flying on an animal. Being aggressive can easily be foolhardy. However, Saw is able to translate his aggressiveness into martial success through being a good fighter. Whether it is through his brashness or working together with his fellow rebels, he is willing to fight and do whatever is needed to win. As Kishino described Saw several years ago in an interview with StarWars.com, Saw is “the guy, who, from that generation, isn’t afraid to get his hands dirty or to back down from a fight.” He’s willing to fight, wants to fight, and is good at it. 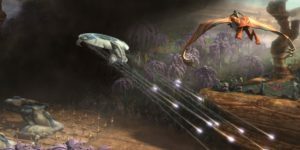 He’s willing to learn how to fight, as we see him trying to roll a droid popper within a shield of a droideka, initially not succeeding, but eventually doing so in “Front Runners”. That Saw can fight is good, but why does Saw fight? It is very clear that Saw is fighting due to his loyalties. The first time we see him on-screen, communicating through a holo to the Jedis, he implores Jedi to help them and he’s not afraid to ask for their help: “Our true king has been silenced. The one you recognize is a traitor and a Separatist minion. We need your help to survive this.” It’s one thing to say this to those who are one’s allies, but he’s also willing to tell this to his enemies, even under torture. 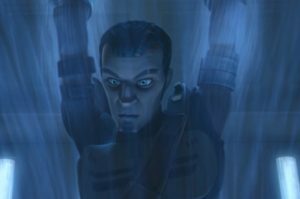 In “The Soft War”, he is enduring electroshock torture and, having been asked where the other rebels are, he says to them “Onderon is our system, not yours.” This emerges especially when Saw is having a conversation with General Tandin, who calls Saw a terrorist: “I’m not a terrorist, a patriot, And resistance is not terrorism. King Dendup chose his people instead of taking a side in the intergalactic war. Separatists have taken over Onderon because we let them.” Saw is clearly animated by the desire to free Onderon from the Separatists. The final thing I wish to observe about Saw is that he is not emotionally well-connected. Some might even say that he does not have a good emotional intelligence. 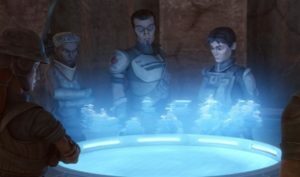 We first see this at the end of “Front Runners”, when Steela is elected to be the leader of the rebels, while Saw is upset about it and leaves the party. Instead of understanding that they liked her better as a leader, he sulks off to be by himself (although we don’t know how he processes that upsetness). In this trialogue taking place amongst the Onderonian rebels, we see that Saw is, of course, aggressive, but also lacking in understanding why they would be afraid. He is so singularly focussed on what they’re doing, he cannot understand why other people would think the way they do. The most emotionally interesting moment for Saw Gerrera was when he shot down a Separatist gunship using a rocket launcher, yet it landed in such a way as to ultimately cause her demise. When he sees her pass away, he is guilt-stricken, lamenting that “It was my fault: I shot that gunship down. It crashed into her position.” However, Lux Bonteri is quick to console him and assuage his guilt. He is obviously tremendously in shock and needing to process his sister’s death. 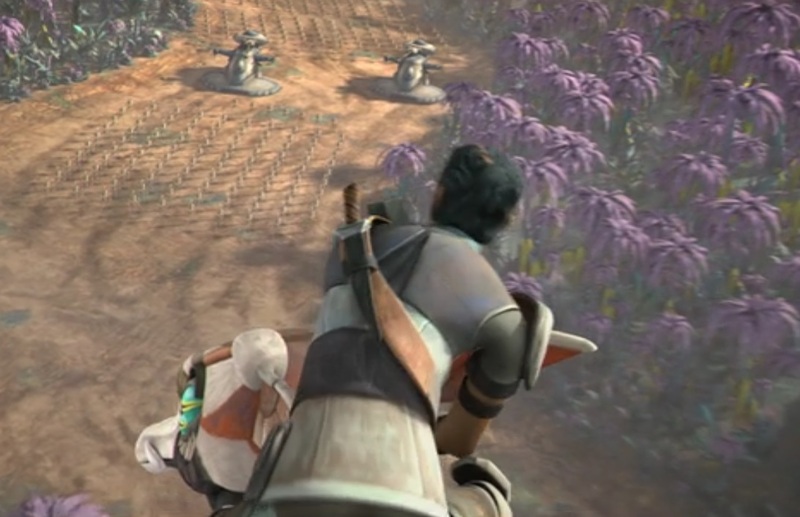 However, in the following scene, when people are paying their respects, Ahsoka Tano says to him, “I’m sorry about your loss.” His response to padawan Tano is a somber, “Thanks, but it’s over now.” He then quickly changes from a somber tone to a terse, somewhat upset tone, concluding, “Let’s just leave it at that.” It is clear that, while he is sad, he has not yet fully processed his sister’s loss. Will he? We don’t know. 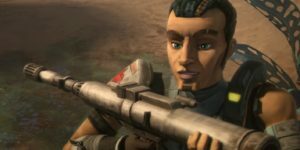 In sum, the five primary descriptors I would use in regard to Saw Gerrera as we see him in Star Wars The Clone wars is that he is brash, aggressive, a good fighter, fiercely loyal to Onderon, and not emotionally well-connected. I am quite curious to see how his character is similar or different in Rogue One…. * These episodes are available on Netflix: “A War on Two Fronts”, “Front Runners”, “The Soft War”, and “Tipping Points”.